Wetsuits and Dry Suits: What’s the Difference? Which Suit should You Use? If you are new to the sport of scuba diving, you may be wondering which is better, a wetsuit or a dry suit. Actually, it is not a matter of which one is better for you, but which one is better for the type of diving you plan on doing. For instance, if you are going to be diving in warmer areas, a wetsuit is going to suffice. But if you are going to be doing cold water dives, a dry suit is going to keep you a lot warmer and dryer. Today, we are going to take a look at the differences between wetsuits and dry suits, and what each are best used for. When scuba diving, you do need to wear either a wetsuit or a dry suit. These suits will help to prevent your body temperature from dropping so you don’t end up with hypothermia, which is very dangerous and can cause death. Both types of suits have basically the same function, which is to protect the wearer and keep him or her comfortable while in the water. However, each type of suit works differently to achieve the same results. There are many differences between these two types of diving suits, from design, to materials, to their intended use. A wetsuit is used for water sports in waters that are cool to cold. When it comes to the construction of a wetsuit, the best type will be tightly fitted around the body and made of a type of rubber material known as neoprene. Some wetsuits cover the entire body, including the arms and legs, there are wetsuit pants, tops, vests, jackets and there is also a type of suit called a “shorty” that is usually used for snorkeling, warm water dives, and other water sports. The thickness of the neoprene will depend on your diving needs. There are several thicknesses, with the thicker suits being better for cold water diving because they will provide more warmth and help keep the body temperature regulated. So, how does a wetsuit work? When the wearer gets into the water, a layer of water will get inside the suit, and essentially be trapped between the suit and your skin. Your own body temperature is going to heat this water, and keep it at a regular temperature. This is how the suit insulates your body against the cold water as you dive down deeper. This warm water stays trapped inside the suit and keeps you warm. Just like a wetsuit, a dry suit is worn to keep you warm while you are diving. However, it works differently, and it allows you to stay warmer in colder water than if you were wearing a regular wetsuit. Dry suits are usually thinner than wetsuits, are loose fitting to allow layers of undergarments to be worn under the drysuit to help your body retain heat, even if you are diving in icy water. They are made with a waterproof shell that can be made with neoprene, membrane, or both. There is also a number of under suit options, as well as gloves, boots, and a hood that complete the outfit. Dry suits work a bit differently than wetsuits. Unlike wetsuits that trap a layer of water between your body and the suit, a dry suit allows no water to get inside at all. It is designed to keep all water out, which is why you need to wear an under suit for added insulation. If you are diving in frigid waters, you will be too cold if you do not have layers beneath the dry suit. 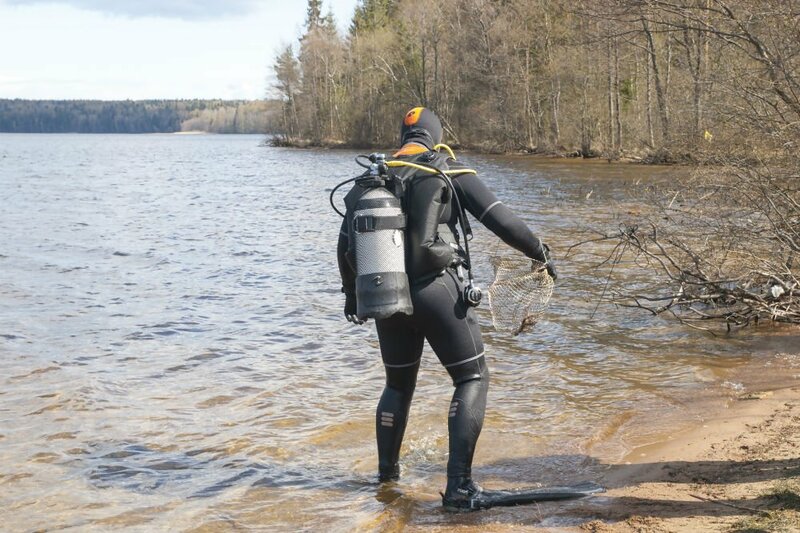 There are some skills that need to be learned and mastered when diving in a drysuit. Since a drysuit has air in the suit, valves are used to control the buoyancy of the suit at different depths. 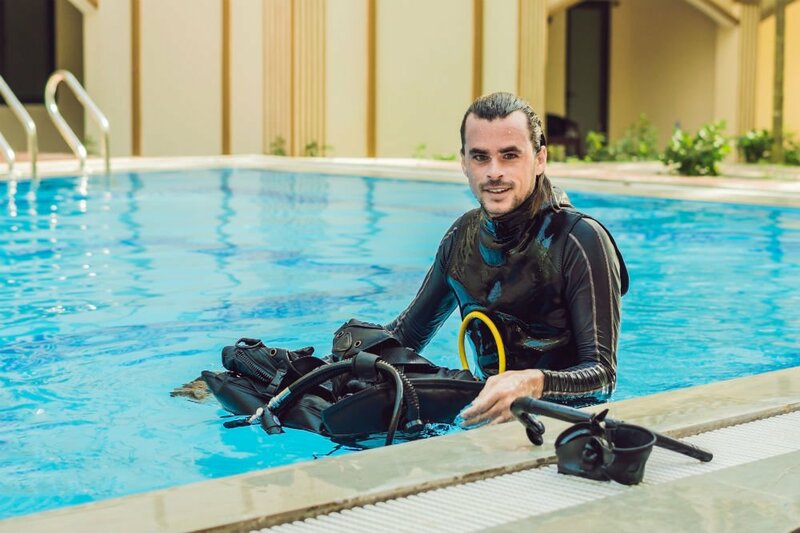 It is highly recommended that you take a drysuit specialty course from a local dive instructor before you take out your drysuit for your first time. So, which type of suit should you be using? Unfortunately, we can’t give you a definitive answer to this question. Often, it is simply a matter of preference. Of course, your choice of suits is going to greatly depend on the temperature of the waters in which you plan on diving, how long you plan on staying in the water, and how sensitive you are to the cold. Generally speaking, if you don’t like to be cold, but you want to dive in colder waters, a dry suit would be recommended. 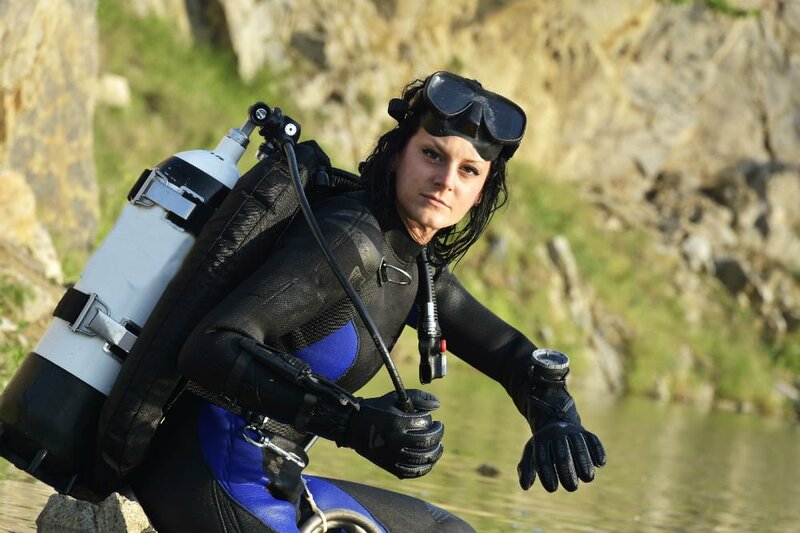 A drysuit also allows you to stay dry and warm after a dive. When the dive is over, you simply take off the drysuit outer shell, leaving you warm and dry in your undergarment clothing. You probably don’t plan on diving in the Arctic, but hey, you never know. Even if you plan on doing some diving in the winter, a dry suit is likely your best option. A good rule of thumb is if the water is colder than 50 degrees Fahrenheit, get yourself a dry suit. If you are going to be diving during the summer months in waters that are warmer, you can easily get away with a regular wetsuit. If the water is between 25 and 50 degrees F, it is a good idea to get a dry suit made from thicker materials. Whether you choose a wetsuit or a dry suit, there is going to be some maintenance involved. The better care you take of your suit, the longer its lifespan is going to be. Make sure that you thoroughly clean the suit with fresh water and detergent-free soap after each use. Rinse away all traces of soap, turn the suit inside out, and hang it to dry, using a padded hanger or a hanger that is made for scuba suits. If there are any nicks or tears, repair them as soon as possible to avoid having them grow larger, requiring you to go out and buy a new wetsuit or drysuit. When it comes to choosing the right scuba suit, there is no need to feel overwhelmed. Just consider the type of diving you plan on doing, where you plan on diving, and the seasons in which you want to dive. If you think that you are going to be diving in very cold or even frigid waters a lot, then it is a good idea to invest in a quality dry suit. If you are only going to be diving during the summer months in warmer waters, a wet suit will suffice. If you can afford it, why not just get one of each? That way, you will have a suit for any type of dive you wish to do.